Each person is different and when it comes to preserving your beautiful smile, you deserve a treatment that’s specific to your needs. But if fear of the dentist is keeping you from preserving your oral health, it’s important to find a dental sedation option that fits your needs. Fear of the dentist is one of the most common phobias reported among adult Americans. Reported numbers show that up to 75% of US adults experience some level of anxiety or dental fear. Dental sedation uses sedative drugs to calm and relax nervous dental patients. Sometimes distraction can be used as an alternative to dental sedation. Using a technique called sound masking can work well. This can be listening to great music with noise canceling headphones. This could also be watching a good movie while listening with the same noise canceling headphones. 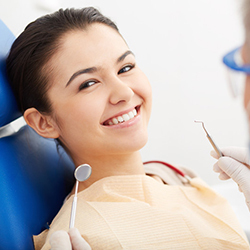 Dental sedation uses sedative medicine to relax patients to create a safe and comfortable dental experience. The following types of dental sedation are sometimes referred to as sleep dentistry or anxiety free dentistry. In these procedures the patient is actually conscious but placed into a very relaxed state. Inhalation Sedation: This uses a combination of Nitrous Oxide (N2O) and Oxygen (O2) to introduce a state of relaxation. This is a conscious sedation method that is fast acting and with few side effects. A local anesthetic is administered in combination with nitrous oxide sedation to eliminate pain. Oral Sedation: Oral sedative tranquilizers are given prior to the dental procedure to produce a very relaxed state. This may be used in combination with nitrous oxide depending on the severity of the anxiety. Oral sedation does provide pain relief, so a local anesthetic is administered in combination. You will not be able to drive yourself after oral sedation so be prepared to arrange for someone to drive you. IV Sedation: IV stands for intravenous where the sedation medication is delivered through a small needle that is placed on the back of your hand or on your inner elbow. IV sedation dentistry is often preferred because of its rapid effects. Just like other types of sedation dentistry this is a conscious dental sedation that acts to calm and relax you. Oral sedation and inhalation sedation can be used in combination with IV sedation dentistry. Dr. Kidess is a board certified sedation dentist serving the greater Scottsdale, AZ area. Whether you’re interested in IV sedation dentistry or you just want to know which type of dental sedation is best for you, contact Dr. Kidess today at (480) 991-2290 to schedule an appointment.